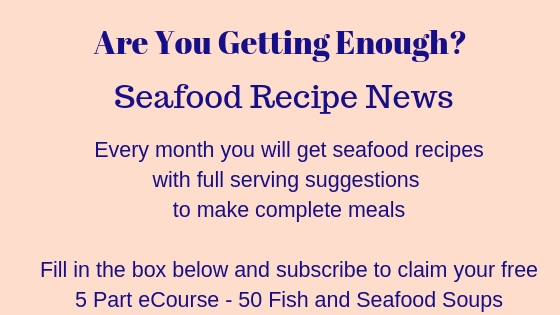 Orange roughy fish recipes - any recipe for firm white fish fillets will work with orange roughy fish, but here's a great idea for using this fish. If you're following the Atkins Diet, this dish contains 4.5g per serving - and will serve 6. 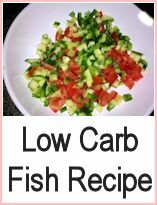 You may struggle to find this particular fish, but don't worry - if you like the recipe (and it's very tasty as well as being lo-carb - you're on a diet, not a penance) then substitute a firm white fish such as cod, haddock, basa etc. 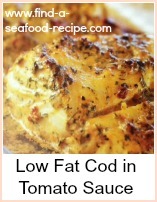 Likewise, if you find some Orange roughy fish, then any white fish recipe will do - where you'd use cod, basa etc. It is a lovely flaky white fish. Take a baking dish large enough to take the fillets in one layer, and pour one tablespoon of the olive oil into it. Add the vegetables and garlic and stir round to coat them in the oil - season with a little salt and pepper and stir in the thyme. 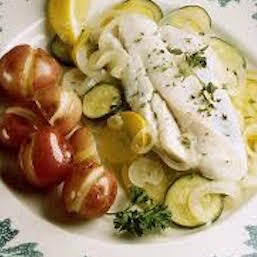 Add the orange roughy fish and pour over the wine and the rest of the oil - season the fish fillets. Return to the oven and bake a further 10 to 15 minutes until the fish is cooked through. Serve with some plain boiled potatoes, sliced zucchini and a lemon wedge. 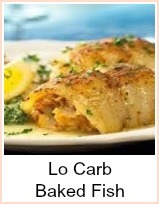 Lo-carb Orange Roughy Fish Recipe - substitute any white fish fillet.